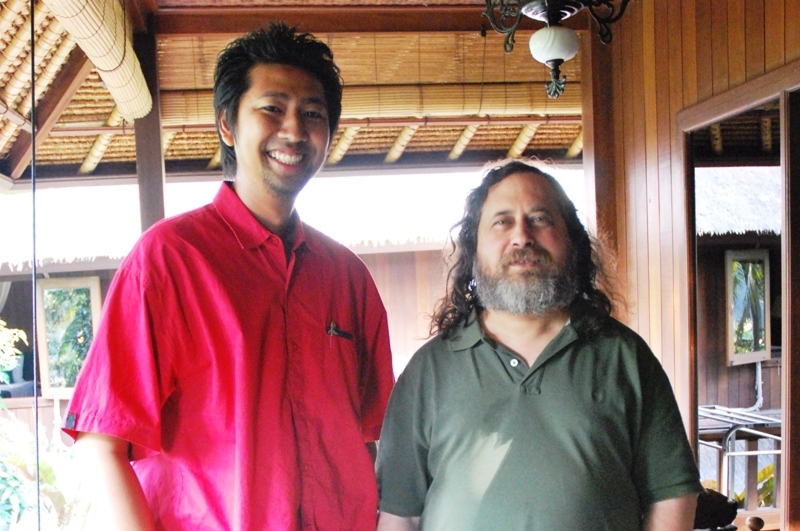 Richard Mathew Stallman as known as RMS is an American Software Freedom Activist would come to Bali on 1 until 7 November 2009 after his last visiting to indonesia on 2004. RMS also known as founder of GNU project. The name “GNU” is a recursive acronym for “GNU’s Not Unix!”; it is pronounced g-noo, as one syllable with no vowel sound between the g and the n.The GNU Project was launched in 1984 to develop a complete Unix-like operating system which is free software: the GNU system. At GNU.org you can found some explanation about Free Software. Free software is about a Liberty TO USE the software not about the prices (gnu.org). In visiting to Indonesia RMS will give speech to an event before Global Conference on Open Source (GCOS) which will be attended at Jakarta. RMS would not give speech on GCOS because there are some different about Free Software which introduced by RMS and Open Source Software. As the first computer science department in University of Udayana, we don’t want to miss this opportunity. Becouse we see Indonesia as a developed country need some breakthrough to develop our IT infrasturcture and the movement of Free Software wich is introduced by RMS can be the one solution for us. Hopefully as the young computer science department , we can learn much more about Free Software Movement directly from the founder. After made some contacts with RMS, he is agreed to give some speech at Udayana University. Hopefully RMS can give two speech about Free Software Movement and GNU /LINUX Operating System so we can take full advantage of the RMS’s visit. Copyright © 2019 Bali Open Source Support .